Whenever we guide a group of campers into the backcountry on one of our guided trips, its always good thing if we never have to touch the first-aid kit. Not knowing what the skill and experience level of our guests may be, there is always that chance that someone could get hurt. 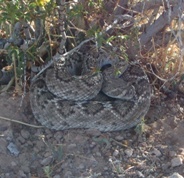 Especially on the desert, where pretty much everything from rocks, to cactus, to rattlesnakes, are going to put a hurt on if you encounter them in the wrong way. This was a good trip. I dont recall using even a band-aid this time around! Our campsite was ideal – just far enough back in the mountains to be hidden away and provide a feeling of complete isolation. 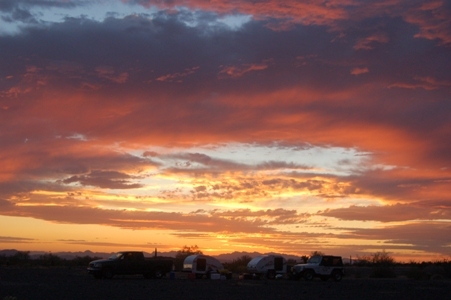 It was flat enough for everyone to park their trailers and set their tents on level desert pavement, as it is called. We had a spectacular view of the mountains, and the evening sunsets were everything I had hoped they would be. On the desert the sunsets are almost always spectacular, and this trip was no disappointment. Probably the moment everyone will remember the most is when a 6′ Western Diamondback rattlesnake wandered into camp and right between the legs of Mary, one of our guests. Good thing he wasnt hungry I guess. If it had been up to me, it would have been dinner and a hatband, but ultimately we agreed to just move him a few hundred yards from camp. He must’ve read my mind because he stayed away the rest of the trip! Another highlight were the 4WD trail-rides that we took on the old mining roads, winding our way up, over and around the mountains to view some great old ghost gold mines, the old stone cabins of 19th century French miners, and a beautiful looking Big Horn Sheep was watched us pass by from a ridge high above the road. Saturday nights Potluck dinner was fantastic, with everyone providing delicious food prepared in camp. 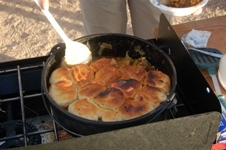 My favorite was the dutch-oven stew with biscuits cooked right on top of the stew. We also had brats, salad, even pies, all served in camp right around sunset. It was a perfect way to cap off a great trip. My favorite memory is always the smiles and great comments we recieve from our guest. Our goal is to design backcountry trips that are unique and unlike the regular camping rally’s in crowded campgrounds. We want to show our guests how vast the west really is, how much open land there is to explore, and how much history there is to discover by simply getting off the beaten path. One comment from a guest who came from Michigan really stuck with me. He said that, to him, the trip was “like one of life’s little nuggets, that if you don’t bend over to pick it up, you’ll never know what you missed.” Thats what I’m talking about. 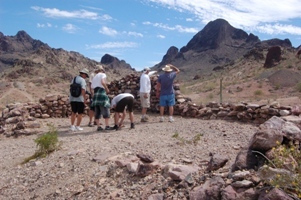 I love the outdoors, I love the desert, and I love sharing my passion for history with our guests, with the hope of adding a new dimension to their experience. the mid-90’s for the 4 days we were there, and then of course dropping back down into the lo-80’s on the day we left. But no one seemed to mind the daytime heat too much – we kept busy during the days and that really helped. But the evenings – they were spectacular! Perfect temps, light gentle breezes, and no moon which made for some really great star-gazing. Being that far out the night sky is usually brilliant, and the Milky Way was like a streak of white across the sky. We really couldnt have asked for better weather or nicer folks this time. It is always great to meet, and get to know new folks on every trip, and after sharing such an experience folks seem to develop a special bond. Thanks to all our guests who joined in and help make the experience enjoyable for everyone. Sharing all of this with you is the little nugget that I pick up on every trip we take. If you would like to read more about our backcountry trip, watch the August and September issues of Camping Life Magazine. We were privledged to have one of their writers along on this trip, and he has written a story about it that will appear in the publication very soon.